Flinders Island, located in the eastern side of Bass Strait is one of Australia’s, if not, the world’s best kept secret! Situated approximately 8 km from Whitemark, the islands most populous town, is Yakkalla Holiday Cottage offering modern accommodation. 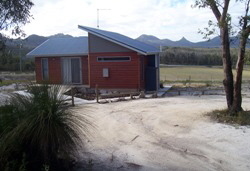 The cottage is situated on Yakkalla farm with commanding views of the Darling Range and the majestic Mt Strzelecki (the island’s highest point). Watch the sun rise over the range in the morning and after a day out fishing, touring or walking, watch the Darling Range change color as the sun sets! Flinders Island is only an hour’s flight from mainland Australia and forty minutes from Tasmania. Once there you will feel like you’re worlds away. Please take a few moments to view our web site which gives a brief overview of Flinders Island including a photo folio. Contact us if you have any queries about Yakkalla Holiday Cottage. Sleeps up to 5 people. A luxurious queen sized bed in the main bedroom and double bed with a single bunk above in the second. The modern facilities include, reverse cycle air con, TV and DVD, a small self contained kitchen (incl microwave, bar fridge, and conventional oven), laundry facilities and a modern bathroom/toilet. Check in/out time is negotiable due to varying airline schedules. Easy access makes it ideal for the elderly or wheelchair users.